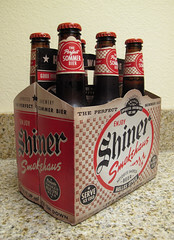 Intro: From the makers of the well-known Shiner Bock, the Shiner Smokehaus is made with malt smoked over mesquite chips at the TX brewery. The label claims that you should “Serve Ice Cold”, which made me a bit skeptical of how it was going to taste once it warmed up a bit. But, I was pleasantly surprised. Description: Pours golden with a medium head. Mesquite smoke comes out in the aroma and more follows in the taste. As far as smoked beers go, the smoke is light to moderate. But, it really is a nice balance of a thirst-quenching light beer and a just enough smoke. The rest of the beer is clean and lightly sweet. If you are new to smoked beers, this is a good intro example. If you’re already a fan of the style, this is worth checking out as a light ABV session smoked beer. This would be a perfect six-pack to bring to your next BBQ. It should taste good with steak. Unfortunately, I prefer drinking chai tea.